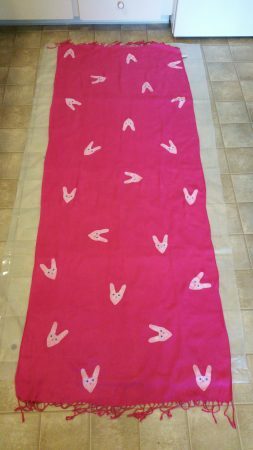 Here is the latest accessory in the Funny Bunny Collection! 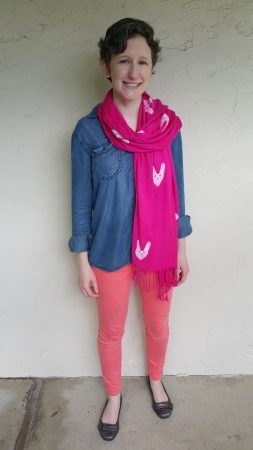 This scarf is the perfect addition to the Funny Bunny earrings we featured last week. (See that post here.) Today’s tutorial features both fabric-stamping methods and step by step instructions for making your own stamp! I started by gathering materials to make my bunny stamp. 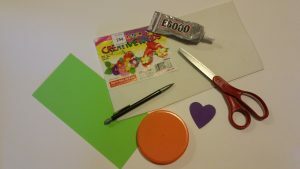 A purple foam heart from the kid’s craft section would become the bunny’s head. I traced the heart on scratch paper and sketched ears. I folded the sketch in half and cut it out. 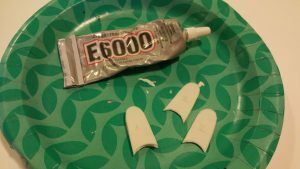 Next, I cut out the “ears” so they could be used as templates. The next step was tracing the ear templates onto craft foam. I traced 2 of each ear and numbered them so I wouldn’t get confused. 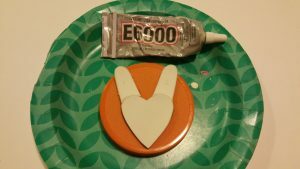 After cutting out the ears, I used the E6000 to glue the matching shapes together. I did this to add thickness to my future stamp. (A thicker stamp will be easier to paint neatly.) The foam started to curl around the edges, so I put the glued-together-shapes between pieces of foil and placed a weighted plate on top. This forced the pieces to dry flat. Next, it was time to work on the heart shaped “head.” I glued the foam heart to a large recycled lid. Once the heart was glued to the lid, I created a double layer for it the same way I made the ears. I glued this heart on top of the purple one. Once the double layers were dry, I glued the ears onto the lid as well. After more drying time, I finally had my bunny stamp! I began by testing out my stamp on pink paper. 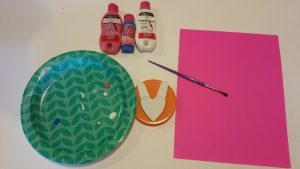 I used the brush to paint a layer of fabric paint onto the stamp. I did several test stamps before I got the hang of exerting even pressure on all areas of the stamp. I also experimented with dipping a pencil eraser lightly in paint and using that to stamp eyes and a nose. Pretty cute! At long last, I got to work on my scarf! I laid the scarf over the plastic shower curtain drop cloth. I then stamped bunnies all over! This process took some time, about half an hour, but patience paid off. I added eyes and noses to the bunnies as the finishing touch! 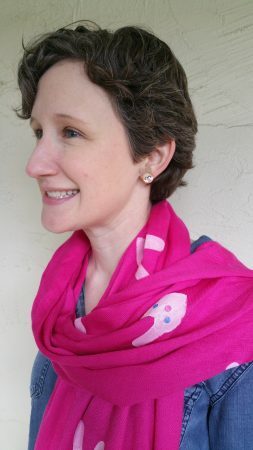 After letting the paint dry for several hours, it was time to try on my scarf!